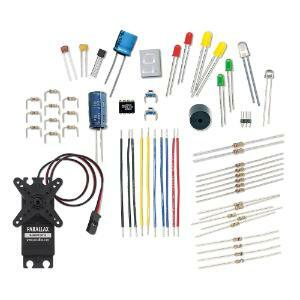 Parts to learn how a microcontroller works. The What's a Microcontroller Parts Kit provides all the electronic components needed to complete the activities in the What's a Microcontroller? text on a BASIC Stamp 2 development board. If you want to learn to make your own BASIC Stamp inventions, learn how these common components work as you go step-by-step through 40 hands-on activities in the 350-page What’s a Microcontroller? text (available for purchase or as a free download). Side-by-side schematics and wiring diagrams give you confidence in building the circuits with the Parts Kit components on a BASIC Stamp 2 development board, and each example program is followed by a detailed explanation so you learn as you go. Ordering information: Kit components include Input components: pushbuttons, single-turn potentiometer, phototransistor; Output devices: LEDs, 7-segment display, servo, piezo speaker; and Passive components: resistors, capacitors, jumper wires; Integrated circuits: digital potentiometer, transistor. Required but not included is Board of Education (Serial) or (USB) and a BASIC Stamp 2 module.